Executive summary: Today, TSplus announces the new release of its all-in-one software for Remote Desktop Connections, Application Publishing, Client Generation, and much more : the TSplus 10.30 Release can now be downloaded for free. What can you expect? 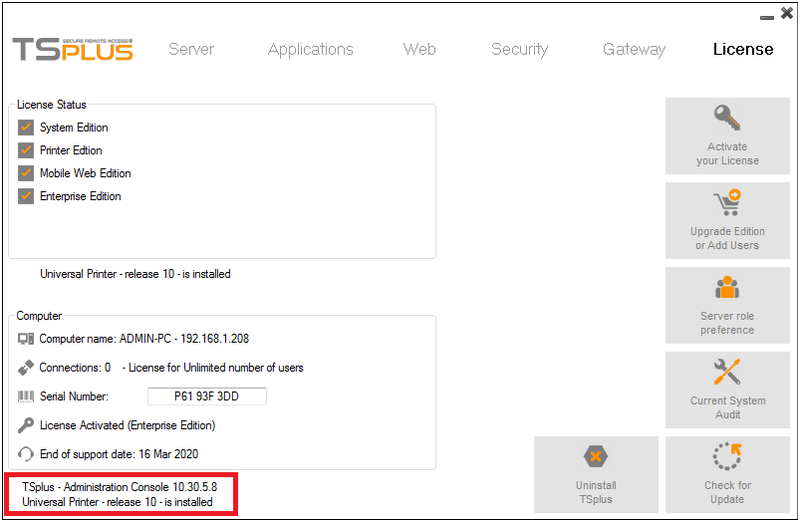 TSplus Development Team enumerates the multiple features that maintain TSplus as the most simple and powerful Citrix alternative. Since 2004, TSplus has been helping businesses to increase their agility with its best-in-class Web Access solutions. TSplus provides the easiest-to-install and easiest-to-use Remote Desktop solution, compatible with any Windows system, accessible from any device and with any browser. The TSplus Enterprise Edition includes a complete panel of features including Universal Printer, HTML5 client, Server Farm Manager and much more for a fraction of Citrix price, and twice easier to implement than Windows RDS. TSplus cares a lot about its customers’ satisfaction. That is why the Development Team is constantly working on improving its star software and bringing new solutions to fill all possible expectations. Following are the changes to be noticed since the 10.20 release. The TSplus Development team has deeply audited the LOGON/LOGOFF process and is proud to offer great solutions to prevent, in most cases, session opening-related issues: TSplus is now able to provide the best performances and the most predictable behavior regardless of the client kind (mstsc, RemoteApp, HTML5, Seamless client) or the kind of started applications (Full Remote Desktop, one single application, TSplus Taskbar, Floating Panel or Web Application Portal). The Web Application Portal was facing issues with double-clicks: when used to launch one application, it was actually starting two sessions with the same application opened twice. This should no longer happen. Besides, the Floating Panel option was not working properly when assigned to a user in the Web App Portal. It is now displaying the applications normally. The Universal Printer is no more installed during the Setup, nor during the Update. In case of the Universal Printer feature is not being installed yet, a message box will be displayed when the Administrator launches the AdminTool. This new process enables a faster Setup. The Universal Printer can also be installed by the administrator by using the new START menu entry. On the other hand, if the Administrator is already using the Universal Printer with an old TSplus release 10 or 9 driver, the AdminTool automatically displays the Universal Printer version on the license tab. If you had a previous version, you will have first to uninstall the Universal Printer using the START menu entry, and then install the new one by using the Universal Printer Installation START menu entry. The Print Preview has been changed: if the user has a PDF viewer like Acrobat, the preview will use it. Otherwise, the TSplus client will automatically use Sumatra as a fallback. 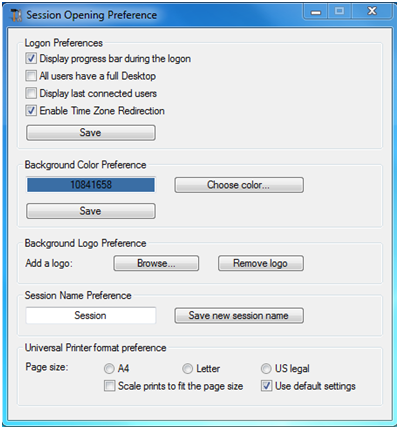 On the Session opening preference tile of the server tab, the user can now change the universal printer format preference with a choice of 3 page sizes: A4, Letter and US Legal, as well as scale prints to fit the page sizes. Of course, he can also still use the default settings. TSplus 10.30 makes all of this possible. TSplus 10.30 is a major release and we recommend you to download and to apply the Update Release, for an optimal experience. IT, see how quickly you can web enable instantly your Windows apps for collaborating, connecting, and increasing productivity. For additional information, visit http://terminalserviceplus.com or send an e-mail to floriane.mer@terminalserviceplus.com who will be pleased to answer you.